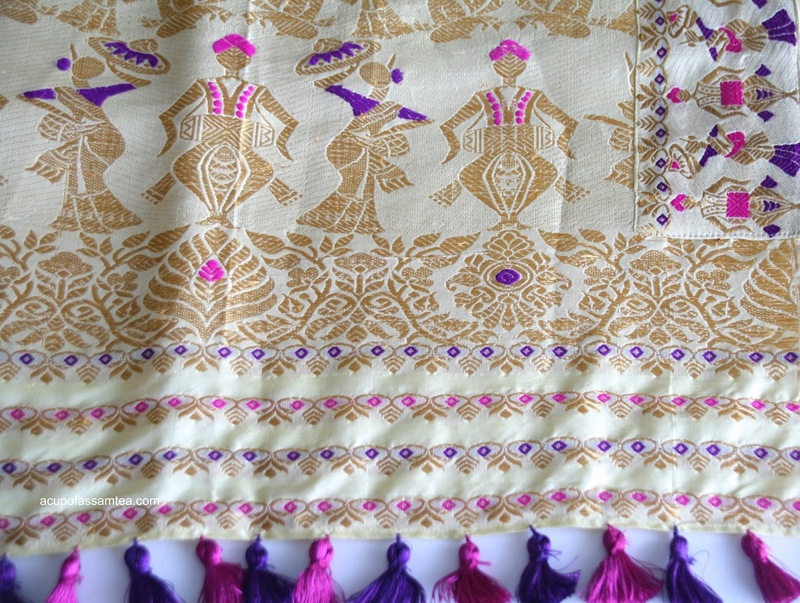 Designer: Kunal Kaushik an acclaimed designer and a born artist, Kunal designs resplendent and redefining Assamese tradition elusive weave that lures one into his signature rhythm and rendition that merge relevant global sensibility. 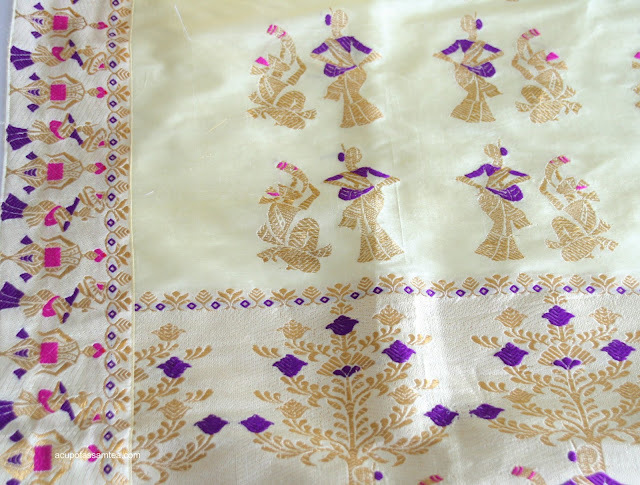 A dream cream color mekhela chadar warp and weft assamese motifs dhulia and nasani (the drummer and damsel dancer) with Kunal's quintessential use of color shocking fuschia pink and periwinkle purple in mina. 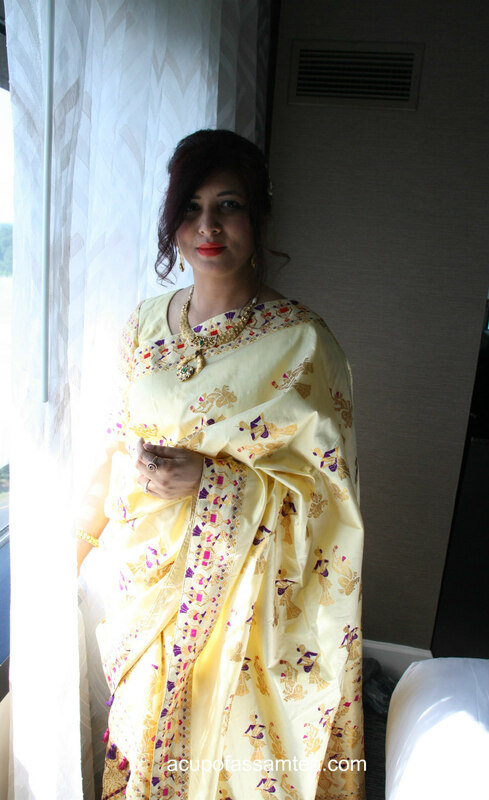 After wearing Kunal, I felt like a modern princess. Kunal designs are not just to wear but cherish and celebrate. No doubt why Kunal is seen as an avant great designer. Event: Assam convention -Assam convention is a celebration of the assamese diaspora in North-America where the assamese community gets together to showcase Assamese culture, food, tradition talent, and invited artists. Every year it is celebrated on July 4th weekend around North America in different cities. This time it was celebrated in Washington DC and the 39th Assam convention. A gorgeous Kunal Kaushik Mekhela chadar does not need much yet going to a formal event, I added a few accessories from my side. As it was a signature assamese event, I don't want to add anything that takes away all the charm. A gold choker to team up with the mekhela chadar. I decided to wear a hair bun that was a little unusual for me and took a risk as hair up always make my rounded face little more rounder. 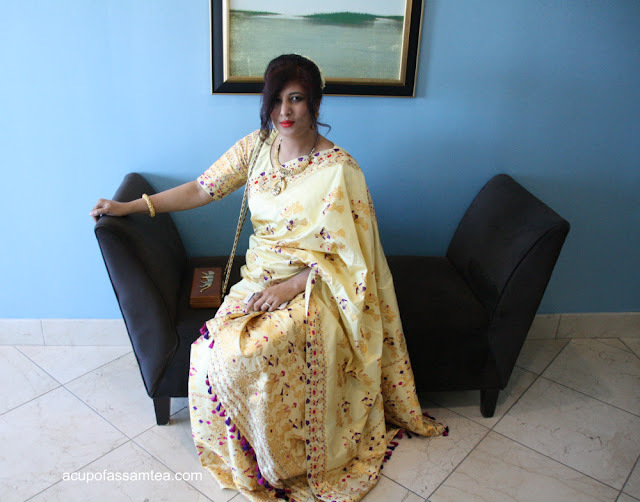 I wanted to give the Assamese look a touch of the southern part of India by wearing jasmine in my hair bun. Wearing flower always enhances the beauty and smell of fresh jasmine personify peace and purity. 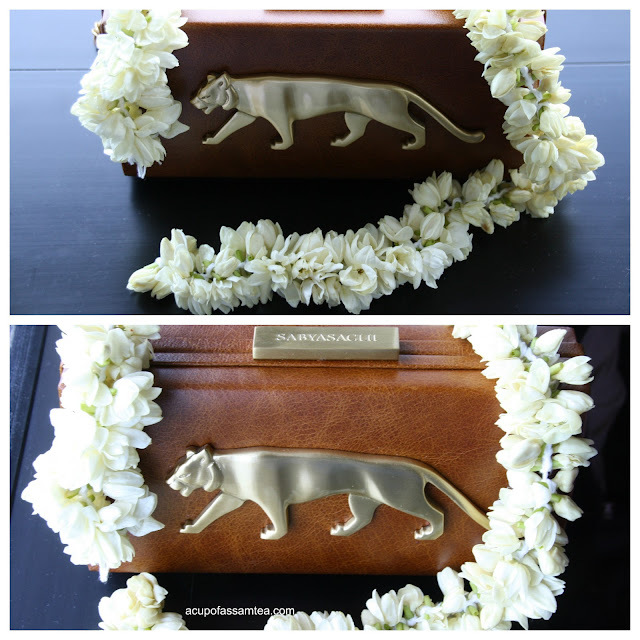 With the traditional look, I added a final touch with classic Sabyasachi box clutch jaguar in it. Let me know your thoughts and have a fantastic weekend. Wow! I love the colors and prints. So vibrant and beautiful. I've always wanted to wear something like this but have no idea how to put it on or put together properly. Thanks for the inspiration. You look so lovely, and I'm sure that the scent of jasmine that followed you was heavenly. The dancers woven into the fabric make me smile. Beautiful. I love the Jasmine, would smell so sweet all day! Your photos are beautiful and I am in love with your hair bun. It looks so elegant, and fit well with your outfit. I love the modern princess style, Kunal design is really outstanding, especially those print which is so unique. Oh wow, the detail in that fabric is amazing. 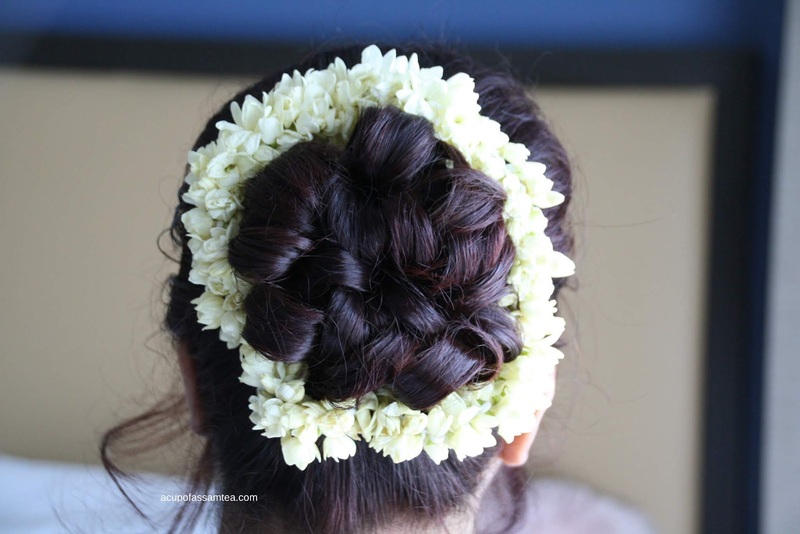 The flowers in your hair - oh how I wish I could be that creative! Oh my gosh I love the elaborate detailing on your outfit of those people dancing! And your hair is gorgeous!I love how you had your bangs hanging in front as well. you look perfect! You look so lovely, and I love that you wore jasmine on your hairbun, I agree that wearing a flower enhances beauty and would make you smell good as well. The details on your outfits are amazing also. This fabric is so pretty! I love the details. The fresh flowers are the perfect accessory. So many gorgeous colors mixing and blending there. I love the style and cut of it as well as all of the just bright colors. And I love the accessories like the hair pieces as well. Very beautiful. Beautiful pictures your accessories are gorgeous. I'll be wearing more flowers to enhance my beauty. This is absolutely stunning. I love the details in the fabric of the gown. Beautiful! Wow. The outfit looks gorgeous and elegant. The details are so amazing! The embroidery is absolutely stunning. The gold on creme is spectacular. That is a very pretty outfit on you. I love the color. What a wonderful post! I love this outfit, it looks amazing. Wow you look gorgeous! I love your outfit and that fabric looks so luxe. Btw you hair matches the whole look perfectly. Wow, you look gorgeous, girl! I love the print of the outfit, and that clutch is very unique! oh my! the print on your dress looks so gorgeous! I absolutely love it. Nice hair do as well - it looks fantastic and shows of your beautiful long neck. What gorgeous photos! You look amazing and that outfit is just divine! Lovely post! You look so beautiful. Your hair looks really nice, up like that. Enjoyed your post. This is so lovely. I wish I could pull of such a look. your outfit really suits on you. You look gorgeous in this outfit! I simply love all the details of the fabric and the flowers in your hair! This is a gorgeous outfit and you look really lovely in it. The intricate designs are so lovely I bet they take a long time to make.